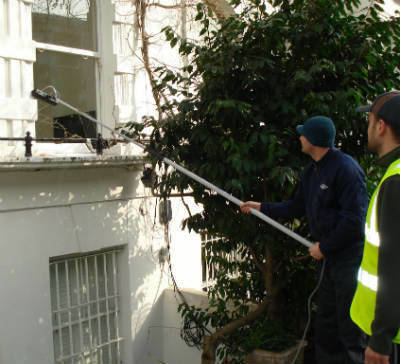 A: We can promptly remove splashes with either outer window cleaning (for four-storey properties), rope access window cleaning (for multistorey properties), or via the common manual cleaning of interior windows. A: Absolutely! This equipment can extend up to 22 metres in length, allowing the team to effortlessly reach and scrub even the farthest corners of your glass surfaces. A: Rainwater is usually dirt-free, so it won't halt us from doing our work. However, while we won't have anything against a slight drizzle, a sudden downpour can lead to unsatisfying results. During thunderstorms, we may have to delay our service for a day of your choice to ensure the team's safety. A: No, the seasoned window cleaners in Ruxley can easily perform outer window cleaning without you being around, as long as your property gates are unbarred. And if you want your casements to sparkle on the inside, just opt for our free of charge key pick-up and delivery option instead. For the last decade, our window cleaning Ruxley service has always brought worthwhile results at the most affordable prices in your district. You can check our rates in our short price table below. With window cleaning in Ruxley, we can better the appeal of your premises even if it brushes the clouds above. Let's review what you'll get once you book our flexible service. For outer window rinsing, the Ruxley window cleaners will deploy a extendible water-fed pole. A water pump inside the team's van will send filtrated water up the hose and out of a brush-head add-on. The water, together with the brush-head, will remove any traces of dust from the casements of any four-storey building. With rope access window cleaning, the specialists will use safe abseiling equipment to reach even the uppermost floors in your commersial or residential property. We possess all required COSHH documentation and risk assessment reports and can send them to you as soon as you need them. In addition, we constantly check the cleaning gear to ensure that your appointment will go without any complications. We are happy to report that our window cleaning in Ruxley has been scheduled by several bordering areas as well. You can see which locations we cover below. Another quick and easy way to get a free instant quote or to book window cleaning services Ruxley DA14 is through our web site.